Group Order Happy Hour Catering Menu Sign Up For Deals! Udon, Soba, Lo Mein, Pad Thai, or Mei Fun. 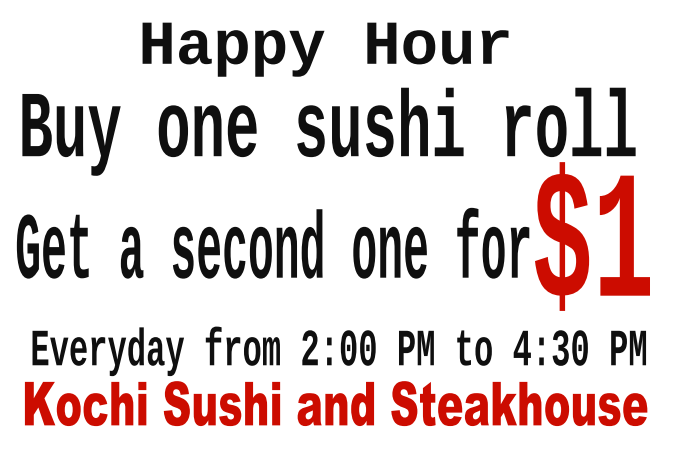 Served with white rice, 3-piece fried shumai, California Roll, and soup or salad. Served with rice, vegetables, and soup or salad. Served with french fries or-rice, and soup or salad. Monday through Saturday, 11:30 a.m. to 3:00 p.m. | Served with white rice, 3-piece fried shumai, 3-piece California Roll, and soup or salad. Monday through Saturday, 11:30 a.m. to 3:00 p.m.
Monday through Saturday, 11:30 a.m. to 3:00 p.m. | Choice of rice served with vegetables and soup or salad. Monday through Saturday, 11:30 a.m. to 3:00 p.m. | Lo Mein, Udon, Soba, or Pad Thai. Monday through Saturday, 11:30 a.m. to 3:00 p.m. | Served with rice and soup or egg roll. Your local Sushi Spot in Cranston! Our menu offers a wide selection of sushi, along with other tasty Asian dishes. Our food is made fresh daily and available at very affordable prices. Order online for take-out or delivery today!————————————————————— Located on Plainfield Pike, across Independence Way. Near Wal-Mart Supercenter, and right off of Plainfield from Hwy 295.